Southern Georgian Bay and Lake Simcoe has Eastern Ontario beat on numbers of islands (30,000 Islands versus 1000) that is offered up by the rugged Georgian Bay. Midland is famous for Sainte-Marie Among the Hurons, the historic French Jesuit mission and the Wye Marsh Wildlife Centre. Wasaga Beach boasts the world's longest freshwater beach and fabulous sand dunes. Off road adventurers can be had on the Ganaraska Trail from Port Hope to Penetanguishene. Collingwood is a popular ski town featuring the Blue Mountain resort. Make sure to check out the Scenic Caves Nature Preserve. Orillia is home to Stephen Leacock, Canadian writer and humourist. Penetanguishene's Discovery Harbour allows you to explore a 19th-century British naval base. These are just some of Ontario's Southern Georgian Bay and Lake Simcoe regions activities. 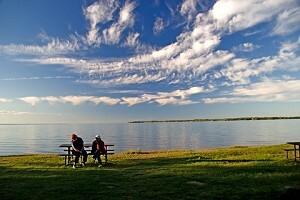 Ontario accommodations include hotels, motels, resorts, bed and breakfast and campgrounds. This Bed and Breakfast in Jackson's Point offers a seasonal outdoor pool and barbecue. Certain accommodations feature a private bathroom with a spa tub, and others have free toiletries and a hairdryer. Some accommodations have a sitting area. Certain rooms include views of the pool or garden. You will find a shared kitchen at the property.